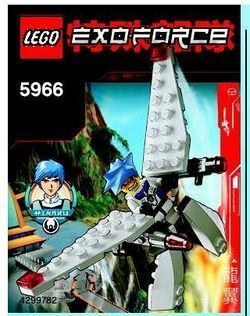 5966 Glider is an Exo-Force set released in 2006. It includes 22 pieces and one minifigure, Hikaru. The glider is built mainly out of white bricks, as are most of Hikaru and Ha-Ya-To's vehicles in 2006, the first year of Exo-Force. On it's left wing, it has a gun built out of a machine gun and a stud. The other side has a missile launcher, along with a machine gun. The set has never been seen in the storyline. However, a similar design has been seen in the set 7709 Sentai Fortress as Ha-Ya-To's glider. On the box-art, it shows what could be the 7709 Sentai Fortress. This page was last edited on 6 November 2016, at 17:54.